Heaven forbid we ever stop dreaming. Yes, if all education were to cost what Bellmont Hill or Sidwell Friends School charge per student, we might face a general tax increase. But Clear Spring School offers another example. Our tuition rate at CSS is less than what most public schools allocate per child. We have small classes, particularly in the lower grades where small classes matter most, and we offer hands-on learning to all. Our students are sorry to see the summer vacation come because they love school so much. Many things in school are eased when a strategy of hands-on learning is put in place. The shame I was attempting to point out is that while politicians devise schemes to appeal to their electorate, we should be watching what they do with their own own children as an example of what we should be demanding they offer to the best of their ability to our own. Assuming these elected officials may be the "best and wisest parents" that Dewey was referring to, what they have chosen for their own children describes what we should demand they demand for our own. Each and every one of them. Now, back to the money... Education spending currently comprises 2% of the federal budget and the federal government pays about 10% of the costs. There is no way that general taxes can go up 10-12 times in order to make the improvements I suggest. If we were to choose to invest in our children, whether at the level of Sidwell Friends or Bellmont Hill or not instead of cheaping out all the time, we could find greater resources to invest. For instance, quality education would drastically cut the need for incarceration. The rise of a generation more skilled in interpersonal problem solving would bring new, more efficient less selfish operation to our political landscape. Can you imagine that? Do you know how much money is wasted in Washington, DC just talking about education when that talk comes to naught but further destruction of American schooling? "You are a dreamer" is a great way to challenge, shut down and discourage creative thinking. But personally I am not deterred. Given the failure of American schooling, and the desperate need for qualified problem solvers in our future, will you join me in dreaming and then acting toward fulfillment of our children's need for hands-on learning? If you look for Fellenberg's Hofwyl in Switzerland 4 miles north of Berne, you might have a bit of trouble unless you were to know that the spelling has changed. 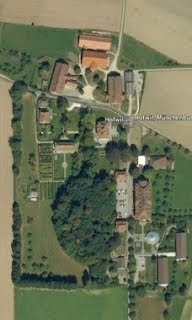 Use Google Earth and you can find Hofwil, Switzerland, quick as can be, and you will find a strong resemblance between the map of the school compound from Charles A. Bennett's History of Manual and Industrial Arts Education up to 1870, and what you can currently see from space. Compare these two views, one from the early 1800's and the other from Google Earth, and you will find many of the early buildings are preserved, and what had been an oval orchard is now a forest in the same shape. The roads, too, transit the site at the same angles as they did at the end of the 18th century. You can click on these images to view in a larger size. Why would any one be interested today in such a place? At some time, perhaps, educators will once again come to their senses and realize the importance of learning through the hands. Fellenberg's Hofwyl, or Hofwil, however you choose to spell it, is hallowed ground. Readers may remember that Fellenberg attempted at Hofwyl to follow Pestalozzi's educational methods and used both crafts and agriculture in the education of children, just as we would today if common sense were to prevail. Hofwil was the home of the first farm school as mentioned in earlier posts. "What the best and wisest parent wants for his own child, that must the community want for all of its children. Any other ideal for our schools is narrow and unlovely; acted upon it destroys our democracy. "－John Dewey. And so, if you were to make an assessment of what American schools should become based on the schools that the presidential candidates chose or have chosen to send their own children, what you would find would be schools vastly different from what they propose for the rest of our kids. For instance, Belmont Hill, where Romney sent his sons, offers woodworking and a variety of other arts you will not find in most schools. At Belmont Hill you will find classes averaging 12 students or less even though Romney claims that size doesn't matter. There, the annual tuition cost is $34,500, or nearly 5 times the amount of money allocated per child in American public education. But don't expect either candidate to ask for the kinds of support that schools would need in order to offer the education to all that they chose for their own children. President Obama's children attend Sidwell Friends School in Washington, DC, a great school where the current tuition rate is $32,069 per child and they maintain a class size of 10 in the lower grades. And there you find what is the great shame of American education. We've long known what it takes to bring the best education to each child, and are unwilling to make that investment. "Aptitude in various handicrafts strengthens the body, and, at the same time, provides a useful form of activity, and serves to occupy the weary, idle hours, especially in the monotonous existence of the household. They can be altered to suit the season. The best of occupations－which cannot be too highly recommended－is gardening, which which almost everywhere, and especially in the country, offers most convenient and most agreeable opportunities. Health is gained; the young gardener learns to labor "in the sweat of his brow"; he lives in close contact with Nature, and learns her laws and her methods better than from books; he has to exercise patience; he teaches himself through his errors; he witnesses a creation of his own in miniature, springing up under his eyes; he finds from experience how much it is worth to enjoy the fruits of his own labor. And at other times other handicrafts, especially mechanical ones, afford entertainment, teach handiness, and exercise the body (and mind). Carpentry is acknowledged to be the most suitable of all, on account of the complexity of the work and the tools, and because it does not put too great strain upon the strength of the young... Above all, it is well that the young should become familiar with the ordinary tools of a household, of which, moreover, one has such constant need－for example, the saw, axe, gimlet and hammer, etc. 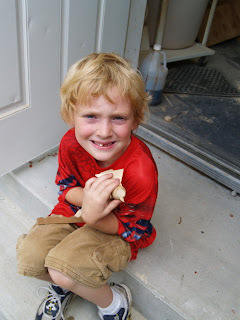 To keep these things anxiously out of the children's reach is the most certain way to reduce to helplessness, and, in the time of need to make them more liable to injury." Today, I will be cleaning my wood shops, both at home and at school, preparing for deliveries to Crystal Bridges Museum gift store, and for the Bentonville ArtWalk on Friday and Saturday where I will be selling my work. As you can see in the photo above, my jewelry boxes are almost complete. Reader Reuben sent this video about "deep crafting," a maker's attempt to intellectualize his creative design process. I am curious what readers think, and I am offering this with a request for feedback, and to stimulate conversation. Is it useful to use the term "deep" in place of more common terminology like "quality"? Is it useful to describe what we might find on Etsy as being shallow in comparison to one's own work? Is the "inclination to make" a condition that naturally pushes the craftsman's work toward gradual improvement? In watching this video, I was reminded of design schools where the objective is often to be radically different in one's work, rather than to progress in an evolutionary manner. Would another term that we might use to explore craftsmanship, be mature? Could one say that as one matures as a craftsman, a person might be driven toward some level of consistency in both effort and quality? I suspect that development is most often arrested by success. Any thoughts? Share your own in the comments below. Randall sent a link to a New York Times article suggesting that faster and more efficient is often not better. Let’s Be Less Productive by Tim Jackson. But people often achieve a greater sense of well-being and fulfillment, both as producers and consumers of such activities, than they ever do in the time-poor, materialistic supermarket economy in which most of our lives are spent. An earlier blog post from this site is related to both of the items featured above. If its baroque, fix it, which is about "slow making". "What the best and wisest parent wants for his own child, that must the community want for all of its children. Any other ideal for our schools is narrow and unlovely; acted upon it destroys our democracy." At any given moment, something in our homes, or garages or work shops is either broken or about to break. You may remember last week that I had fixed our power washer. It required a part that cost less than 10 bucks including postage. Now that I presumed it to be working again I thought I'd use it to wash the car, the tractor, the garage door and the truck. It made it through washing the car before it quit. This time, it wasn't a problem with a leak as before. Now the motor wouldn't turn on, which meant, either there would be a problem with the power supply or with the switch inside, or worse. I checked that the circuit had power and then felt the cord to see if it had hot spots which would indicate a possible short circuit. Sure enough, the cord was hot in one spot. Was it a problem with the wire inside, or had it been simply sitting in the sun? I decided to give it a further test. I coiled the cord up, and plugged it into an extension cord. It worked. Perhaps the change in position of the cord held the wiring inside to reconnect. Just repositioning the cord is not a long term fix. I will need to replace the power cord. On the other hand, it worked long enough without problems to wash the tractor, the truck and garage door. And I saved the blamed thing again from an untimely trip to the landfill. At any given moment, something in your home or garage or work shop is either broken or about to break. And the question becomes, would you rather be master of what you possess, able to diagnose and fix problems yourself or a slave to all machines? Today I've also been making interior dividers for 7 small jewelry boxes. My objective is to get at least two of them completed to deliver to Crystal Bridges Museum Gift Store on Wednesday. With the dividers completed, all I have left is application of Danish oil and final assembly including Brusso brass hinges. "There are many conversations taking place right now about creativity -- how our future depends on it, how our kids are losing it, how most schools are killing it, and how parents ought to be nurturing and encouraging it." 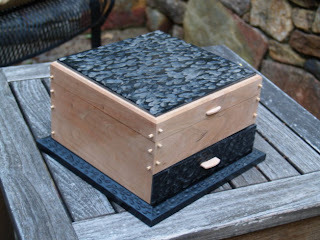 As you can see I am nearing completion of my new design jewelry boxes. I still need to apply Danish oil, make dividers and linings for the inside and install hinges. "Wehrli had requested Fellenberg to allow him to take three poor, neglected boys, whom he had found, into the farmhouse and go there himself and live with them. 'Here Wehrli partook of their straw beds and vegetable diet, became their fellow laborer and companion, as well as their teacher.' Thus was laid the foundation for the farm school, or agricultural school, or 'poor school,' which became the most striking feature of Fellenberg's institution. In what became Fellenberg's "Farm and trade school" students worked throughout the summers tending crops and animals, but also learned to make their own agricultural implements, the surplus of which were sold to neighboring farms. Here in the US where schools have traditionally been off for the summer months, it seems we are missing a valuable summer learning opportunity. When we were a primarily agricultural nation, summer vacation from school was necessary so that children could help their parents on the farm. Now, too few children have that kind of learning opportunity and are left doing things that contribute far too little to their education. I can imagine "farm schools" throughout our nation in which students could enhance their normal school lessons with real hands-on learning opportunities if even only a few young teachers were inspired by Wehrli's example. 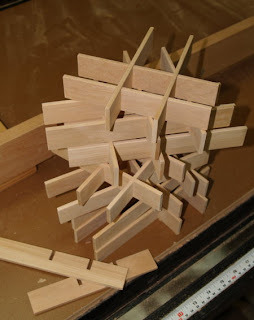 "It was Wehrli's custom to make as many connections as possible in the boys' minds between the school studies and the manual work. While at work in the fields they received some of their most valuable lessons in geography, history, natural science, and geometry as well as religion and morals. Fellenberg (a follower of Pestalozzi's principles) believed in the closest possible connection between theory and practice. He said: "Instruction should be followed by action as closely as the lightning by the thunder, and the life should be in complete harmony with the studies." "He was priest, teacher, elder brother and constant companion. Under his leadership the results were remarkable. Vagrants and beggars became industrious workers; the vicious and lawless became manly and obedient. Through labor and study and contact with a strong, sympathetic, high-minded personality these boys became valuable citizens, and many of them secured positions of trust and large responsibility." Today in my wood shop, I am finishing jewelry boxes I started over a month ago, and attempting to clean shop. 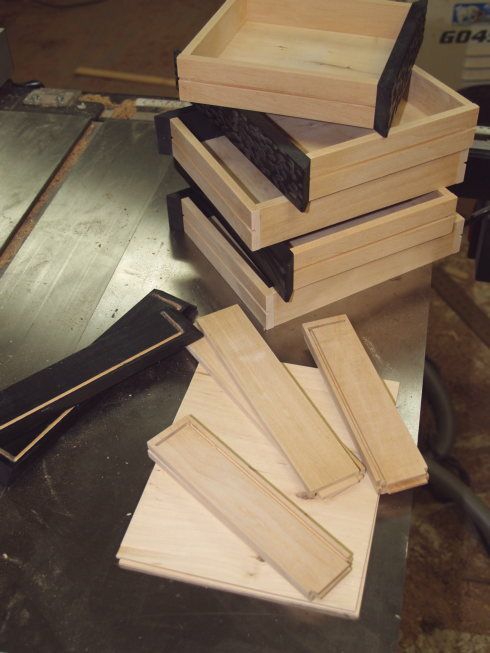 The photo above shows jewelry box drawer parts milled and ready for assembly. We think of schooling as having to do with knowledge rather than abilities. 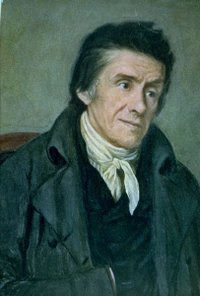 Pestalozzi 1746-1827 was one of the early educators in the progressive education movement and Charles A. Bennett noted in his book, History of Manual and Industrial Education up to 1870, that Pestalozzi was also recognized as the father of manual training. He proposed an "alphabet of abilities" that would serve in the same manner as an alphabet of letters, giving students the capacity to do as well as to know. "In endeavoring to impart to the child those practical abilities which every man stands in need of, we ought to follow essentially the same progress, as in the communication of knowledge, beginning from an alphabet of abilities, if I may so express myself, that is to say, from the simplest practical exercises, which being combined with each other, would serve to develop in the child a general fund of ability, to be applied to whatever purpose circumstances might render it necessary in after-life. Such an alphabet, however, has not yet been found, and that for the obvious reason, that it has not been sought for. I am not inclined to think that it would be very difficult to discover it, especially if the research were made with the same zeal, with which even the most trivial abilities connected with the operation of money-getting were attended to. If once discovered, it would be of essential benefit to mankind." In a sense, perhaps in response to Pestalozzi's request for an alphabet of abilities, Otto Salomon systematized learning the skills required for woodworking Sloyd, moving from the known to the unknown, the easy to more difficult, the simple to the complex, and the concrete to the abstract. Imagine schooling that placed as much emphasis on what children can do as on what they may be force fed to know. Pestalozzi recognized that "doing leads to knowing" and that if you pay attention to the former, the latter follows. On another subject, Mitt Romney visited a school in Philadelphia yesterday and claimed that class size makes no difference. If he had perhaps said that class size is not the only thing that matters, he might have spoken the truth, but I can not imagine a child, a parent, or a teacher in the US that would want a higher student to teacher ratio in preference to smaller classes with more individualized attention. It makes me wonder how a mainstream presidential candidate can be so completely out of touch. You can find the Tennessee study commissioned by a Republican governor that sets matters straight here. We had a wonderful Celebration of the Child program today in which each student was acknowledged for his or her wonderful attributes. This evening we had high school graduation. Unlike most schools, each of our students made a speech. Each was sincere and effusive in their appreciation of the unique qualities of Clear Spring School. The video above is about Project Based Learning, and shows that schools in addition to CSS can become places where real learning takes place. Today is the last day of the school year at Clear Spring School and the night of high School graduation. We are proud of our students, of our graduates, and of our school. Yesterday, Mitt Romney went on the offensive against teacher's unions as being the primary cause of educational failure in the US. He claimed that we have a 3rd world educational system, and that teachers and most particularly teachers unions are to blame. You can make up all kinds of stuff and get people to believe you. But for those actually interested in education and making things better for our kinds instead of just cheaping out on education in the first place, there are some facts in play beyond low performance by American students in the international PISA tests. Poverty has been determined the primary factor in whether or not children are successful in school. We know that children in poverty can still do well. But can teachers do it all? And should they be blamed when the problems in American schooling are so immense, and teachers themselves have been blamed, marginalized and disparaged in the media and used as a political football? Shame on Mitt for pandering to such anti-intelligent destructive nonsense. 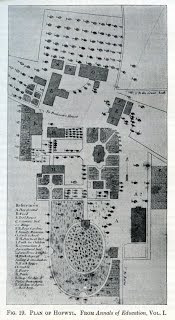 I have been reading Leonard and Gertrude by Pestalozzi and have gotten to the part in which the local land owner has witnessed Gertrude's teaching of her own children and has decided to build a school based on her methods. In this you can see that the novel is inspired by Pestalozzi's own life, in his observations of the loving methodology used by his own widowed mother in providing the spark for learning, even in the midst of poverty. Although Gertrude thus exerted herself to develop very early the manual dexterity of her children, she was in no haste for them to learn to read and write. But she took pains to teach them early how to speak; for, as she said, "of what use is it for a person to be able to read and write, if he cannot speak?-- since reading and writing are only an artificial sort of speech." To this end she used to make the children pronounce syllables after her in regular succession, taking them from an old A-B-C book she had. This exercise in correct and distinct articulation was, however, only a subordinate object in her whole scheme of education, which embraced a true comprehension of life itself. Yet she never adopted the tone of instructor toward her children; she did not say to the; "Child, this is your head, your nose, your hand, your finger;" or: "Where is your eye, your ear?-- but instead, she would say;"Come here child, I will wash your little hands," "I will comb your hair," or: "I will cut your finger-nails." Her verbal instruction seemed to vanish in the spirit of her real activity, in which it always had its source. The result of her system was that each child was skilful, intelligent and active to the full extent that its age and development allowed. The instruction she gave them in the rudiments of arithmetic was intimately connected with the realities of life. She taught them to count the number of steps from one end of the room to the other, and two of the rows of five panes each, in one of the windows, gave her the opportunity to unfold the decimal relations of numbers. She also made them count their threads while spinning, and the number of turns on the reel, when they wound the yarn int skeins. Above all, in very occupation of life she taught them an accurate and intelligent observation of common objects and the forces of nature. One of the things one learns from a reading of Leonard and Gertrude was the use of crafts as a tool in the education process. Gertrude used spinning and weaving as a means to enhance her children's understanding of the world and develop character. 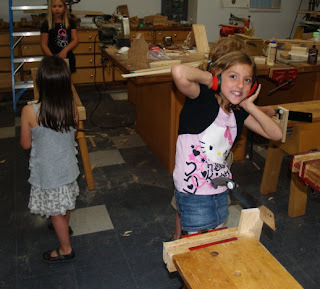 As seen in the photo above, yesterday was our last day of wood shop, with the first, second and third grade students finishing their kangaroos and making tops. 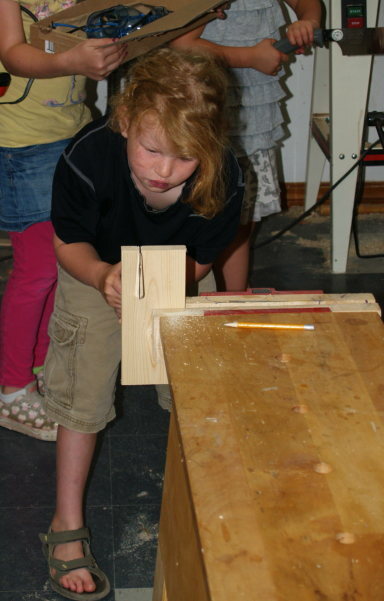 The children in wood shop are nearly never ready to finish their lessons. 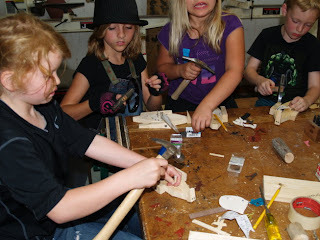 They are sorry to see the school year end, and have told me they would like wood shop lessons to continue all summer. Johan Heinrich Pestalozzi was kind of an "absent-minded professor" of education. He had written a novel, Leonard and Gertrude about a poor mother and her stone mason husband in a small village dominated by a bailiff who used his tavern to keep the citizens drunk, indebted to him and subject to his control. Gertrude was a righteous woman, who despite her poverty, used her creative resources to keep her family fed, clean and clothed while her husband suffered from drunkenness under the malicious influence of the Bailiff. Gertrude managed to get her husband's attention, and thence commenced the story of how a whole community was restored to prosperity and righteousness. In real life Pestalozzi had been brought up by his mother in relative poverty after the death of his father. So when he devised his method of schooling his intent was primarily to serve the poor. His books, Leonard and Gertrude and How Gertrude Teaches Her Children are both available from Google books for free, so with a bit of free reading you can become as much an expert on his life as I. His schools were one failed attempt after another from a financial point of view. His book How Gertrude Teaches Her Children was his attempt in the form of letters to explain his educational method. Pestalozzi had a profound effect on the rise of progressive education through his book and through visits by important folks to the various schools he founded. Much of modern education is driven from the top down rather than from the bottom up. Pestalozzi recognized the power of the simple individual to take matters into his or her own hands and bring profound changes in their own lives and in their communities. How Gertrude conducted herself in relation to her children, husband and community offered a profound example that influenced Froebel in his development of Kindergarten, then Cygnaeus in the founding of the Finnish Folk Schools, and then Salomon in the development of educational Sloyd. Pestalozzi's approach was from a radically different angle from the current efforts at educational reform in the US. We all know that things are broken. Most expect others to fix things. 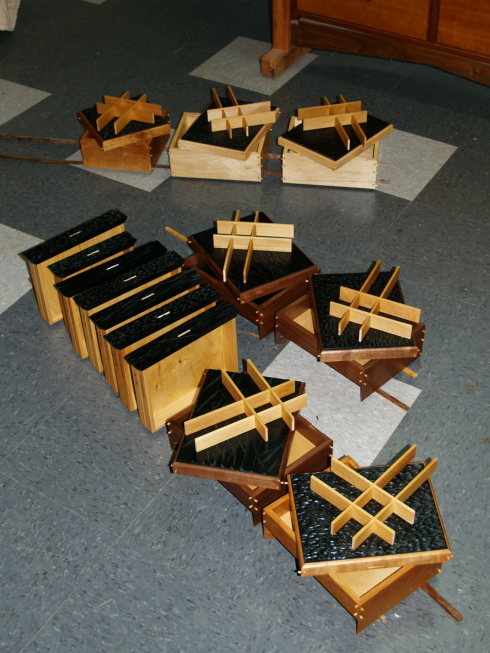 I was contacted by Nick Gibbs, editor of British woodworking magazines about publication of one of my articles about the Wisdom of the Hands at Clear Spring School. 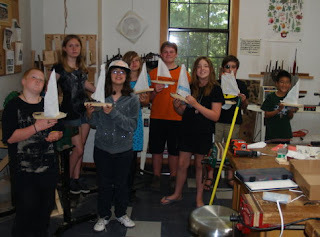 Today in the Clear Spring School wood shop, 4th, 5th and 6th grade students finished the sail boats they have been making as part of their study of oceans. 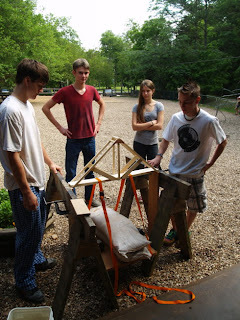 Then this afternoon, the high school students helped me to assemble the SawStop table saws. I had hoped to get them assembled before now, but also hoped to first sell the old saw. I finally just took it apart and moved it out to make room, and it will be sold later. The impact of heavy media and technology use on kids' social, emotional and cognitive development is only beginning to be studied, and the emergent results are serious. While the research is still in its early stages, it suggests that the Internet may actually be changing how our brains work. Too much hypertext and multimedia content has been linked in some kids to limited attention span, lower comprehension, poor focus, greater risk for depression and diminished long-term memory. Even at Clear Spring School, I have difficulty getting the kids to all listen at the same time to instructions that they must hear in order to make even simple things. Today was not my best day. Listening to the kids talking about what they'd seen on youtube, while having to assert my own needs for their attention did not make my day a happy one. I was grumpy. I think I must be ready for summer break, and working with adults who have a much greater interest in what I have to teach. 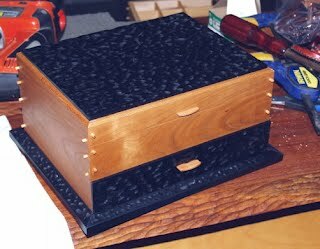 All my summer classes are now full with the exception of openings in my box making class at the Center for Furniture Craftsmanship in Maine. The photos above show the new saws, finally in place and kids with boats. There is little more satisfying than fixing things that are broken and making them work again at little cost. The throw away culture and the waste we live with disgusts me. My wife and I had purchased a power washer, and when I got it out to wash the tractor and truck, water came out in places where it wasn't supposed to but was hidden by the plastic shell. It leaked like crazy but had no useful pressure. When I called a repair shop, they informed me that the unit was essentially a throw away. This last week, I decided to delve into it. I took out the screws holding the plastic shell together so I could see inside and I then hooked it up to the hose to see where it was leaking. A small stream of water came out of the seam between two halves of a small plastic part. I ordered a new part online from ereplacementparts.com for $5.87 plus $3.50 postage and handling. The part came a few days later and the power washer is now fixed. Do many people understand how a person can feel as a result of having being able to fix things, make things work that were broken? In a very real sense, when we fix the things around us, we also fix something that has been broken within ourselves. 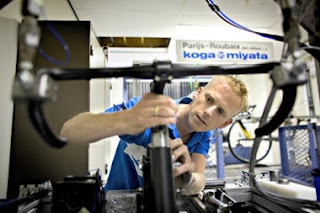 The photo above is from a repair cafe in the Netherlands. Today we have our annual Books in Bloom Literary Festival here in Eureka Springs. It is a wonderful event at which readers can meet writers, buy books, and get to the heart of the matter. Some of the authors write fiction, others write of their own experiences. You can find a list of authors Here. I am kind of partial to how-to writers. Fiction writers tend to carry you away from your own lives for purposes of entertainment. Non-fiction writers often leave you incapable of actually doing anything to resolve the matters at hand. How-to writers are the ones who really help to bring real changes in our own lives. Their work is actually brought to fulfillment when readers have taken matters into their own hands. As the husband of a co-founder, I was involved this morning in set-up and will be there as photographer throughout the day. Yesterday on NPR, I listened to an educator describing how learning can grow in spirals that touch upon every discipline, moving in sequence from one to the next. That sounds like one more over-complicated formula to systematize learning. But the idea does express the interrelationship between all things. I received an inquiry from a recent graduate, an English major, who wanted to build up her resume by writing a guest entry for my blog. On the other hand, I've always thought that writing was best when one wrote about things about which a person has both expertise and passion. Write and write and write, and just as with any other craft, one will get better at it... But is being a good writer enough? If one were to hope to become a good writer, the best starting point would be to have something significant to write about. Check out the arts, music, drama, actual physical engagement in doing real things. Whether fiction, non-fiction, or how-to, writing is best when based on one's own experience. What should be no surprise at all to those who engage the world hands-on, the arts have a tremendous part to play in American education. The President's Turnaround Arts Initiative recognizes this role. They tell that participation in the arts leads to better attendance, and better academic performance. In the early days of the manual arts in American schools, some argued that manual arts instruction would take too much time away from academic instruction, but advocates noted that when real work was thrown into the school curriculum mix, students learned reading, math and core materials more quickly because of increased relevance in the children's own lives. College-bound seniors who studied music in school scored 57 points higher on the verbal SATs and 41 points higher on the math SATs. At-risk students cite their participation in the arts as a reason for staying in school. Arts education deters delinquency and truancy and increases academic performance in at-risk youth. Students in the highest poverty elementary schools are 50% less likely to have arts or music classes. Drama and dance in elementary schools has declined 80% in the last 10 years. Low-income band and orchestra students outscored others on the NELS math assessment. At some point, I hope that educators begin to understand the role of the hands in learning. When you understand the direct relationship between the hand and mind in learning, the rationale for the arts (including wood shop) becomes perfectly clear. Last night's White Street Walk set a record for attendance. With free food and drink and perfect weather, huge crowds of people turned out to admire art + eat, drink, and socialize. 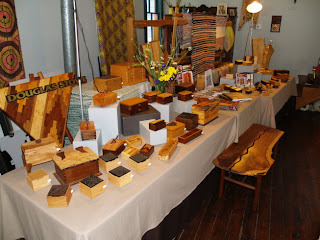 My own display at Lux weaving Studio is shown below. I cannot think about Facebook's IPO yesterday without some sense of regret that our culture has gotten to the point of placing so much inflated value in such temporal/virtual rather than substantive things. The world has become a place for our idle amusement, rather than a place in which we are of real service to each other. A company assembled by a bunch of college students becomes worth billions while those whose work is less dependent on the wonders of technology are virtually ignored. At last night's White Street Walk, I was set up across from the meat tray provided by Bubba's Barbecue. I was witness to folks being torn between two real appetites, hand and eye on the one hand as some grew excited about my work, and hand to mouth on the other. Facebook in real life provides neither. In fact, "social" networking is being shown to have significant anti-social consequences. Something of real greater interest than Facebook, but less likely to make money is revealed in this TED Talk, about making open source farm machinery. Marcin Jakubowski had noted "I finished my 20s with a PhD in fusion energy, and I discovered I was useless. I had no practical skills.” He then proceeded to actually do something about it. He turned his hand to farming, and that failure led him to address real societal change. There are many classes this summer at the Eureka Springs School of the Arts that are worth my readers' interest and attention. I will mention two that will take place in my Clear Spring School wood shop. 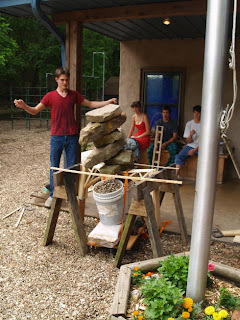 Paul Pitt will be teaching how to make American Indian cedar flutes, June 4-8. Paul, whose American Indian name is Coyote, is an accomplished arts professor whose true passion is making cedar flutes. The last time he was at ESSA, two real foxes came to visit his class, so you know that nearly magical things can happen when students gather to engage in woodworking and enhance the wisdom of their hands. Another woodworking class will be Steven Palmer's class in furniture design, also held in the Clear Spring School wood shop, June 25-29. 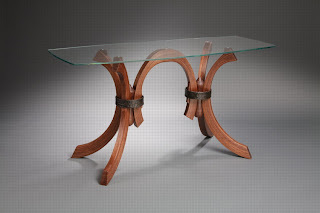 Steve's class will be making tables, and one of Steve's own fabulous designs is shown below. My own ESSA class on building small cabinets is already full, and it appears that my only summer class that still has openings at this time is at the Center for Furniture Craftsmanship, June 18-29. Even there, enrollment is limited to 12 students. I would love to see you there. A blog reader pointed out in a comment that most teachers would agree with me about how children learn, and yet, we know that schools are not set up to deliver hands-on learning for a variety of reasons. One reason is that schools are required to deliver a wide array of subjects, each at a particular narrow breadth, without regard to depth. Another is that class schedules do not allow flexibility. Children moving between classes regulated by bells, quickly discover that their own learning interests are less important than schedules. Teachers, to meet those schedules, are forced to lecture as their most efficient means of adhering to schedule and course requirements, even though all teachers must know that learning by lecture pales in comparison to learning hands-on, as each of us can observe in our own lives that those things we do learn by doing are learned at a deeper level and to greater lasting effect. Another reason is that teachers are drawn from a student population little cognizant of the values and rewards of learning endeavors that require skilled hands. These teachers rarely have experience in setting up hands-on learning opportunities for kids. So what can be done? A deliberate strategy of hands-on learning would bring the following changes to American education... 1. A progressive interdisciplinary, multiple intelligences approach to learning at grades pre-k though 6th. 2. Project based learning grades 6 through 12 with greater use of internships, and a commitment to hands-on learning at all levels in all subjects. The approach we use at Clear Spring School is called integrated thematic instruction. A topic or theme is chosen that children love, and then that theme is explored through classroom work, and craft projects involving math, science, reading, writing, social studies and more. the Wisdom of the Hands program has the specific role of bringing greater hands-on focus, not only in the wood shop, but in the classroom as well. Things get more challenging at middle school where children need to become even more engaged in real noble notions that fulfill their needs to become active participants in community life. Children as they reach middle school age need to be drawn from engagement in fantasy toward having real purpose in their lives. To meet that developmental need, we aim more toward project based learning. In high school, educational concerns become complicated. Students need to become prepared for college, and that means transcripts, practice in testing and greater accountability. As in middle school, learning needs to become even more project based, with those projects meeting real needs within the community. Today in the CSS wood shop, first, second and third grade students began making wooden kangaroos related to their study of Australia. Photos shown above. 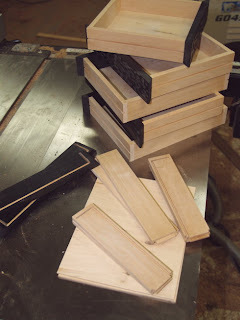 In my own wood shop, I am getting ready for the annual White Street Walk. That means getting boxes ready for delivery. I set up my display tomorrow. We are nearing the end of the school year, and today was my seniors' last day in wood shop. The high school students are making wooden boxes. The 4th, 5th and 6th grade students are making sail boats as part of their study of the oceans. Knowing and doing are so closely connected that if one ceases, the other ceases with it." Doing has a double function; by doing thought is expressed, and by doing thought is also gained and made clear. It is Anschauung, by experience, through the sense of touch or active movement; impression and expression combined. The whole psychological sequence of Pestalozzi is impression, clear idea or knowledge and expression. Observe, think, do and know. One kind of Anschauung, he (Pestalozzi) says, Letter VII, is obtained "by working at one's calling". He connects observation and experience. The point, of course as it relates to this blog, is that we learn best, most thoroughly and to greatest lasting effect when we learn hands-on through real experience. All of this can be tested by the utmost authority. You. Too often the point of instruction is to make certain that children learn what we want them to... we want them to learn the values and beliefs that perfectly mirror our own. Or at least that appears to be the case. The truth of the child is that each is capable of learning from his or her own senses and experiences, and yet the predominant educational inclination is to distort reality toward particular ends. Pestalozzi had said, "There are two ways of instruction. Either we go from words to things, or from things to words. Mine is the second method." And in his second method is the assumption that children may be trusted in their own formulations, and to arrive at their own beliefs, based on their own experiences. The role of the teacher is thus to provide an example of inquiry, an expression of relationship that exudes trust. Froebel had noted that parents with very small children hold them and toss them in ways that establish bonds of trust between them, and within those bonds lies the future of human culture, not within what we say to our children, as instruction about reality, but rather within the trust we express within our own culture of rigorous inquiry. Just as children are tossed up in the air and neatly captured safely on the way down, they reach a point at which all that is necessary is for them to be tossed, and trusted to land on their own feet. The teacher's job therefore is to toss the meaningful questions that incite the child's confidence in exploration of and experimentation within physical and cultural reality. Finnish brain researcher, author and professor Matti Bergström described the child's efforts to ascertain reality in contrast to the adult effort to impose a perceptual framework as the "black-white game." He said that human culture must arise new within each subsequent generation, and so the question becomes "will we trust our children's inherent capacity to observe, explore, experiment and learn and thus allow for human culture to do so?" The current standard of American education says no. Pestalozzi used two particular German terms that are difficult to translate, as they meant more to him than falls into ease of translation. The first was Anschauung, which for some has been understood as the application of undifferentiated consciousness. The second term was fertigkeit which meant roughly, to do something with skill. By exploring these two concepts, Pestalozzi's method has the potential of becoming clear. Ask a child to explore and then test what he or she has discovered by skilled doing. "Every youth should learn to do something thoroughly with his hands in order to know what touch means". By failing to engage our children in growth of skill, and by failing to trust their powers of direct learning we leave them out of touch. One of the most direct consequences of our current method of education is that students too often pay too little attention to what they have done, and see too little need for their attention in what they do. They may seem quite willing to go through the motions, but when you assemble a box out of square with too little attention paid to the fit of the joints, for example, after the glue has set you may not need the teacher to point things out for you. 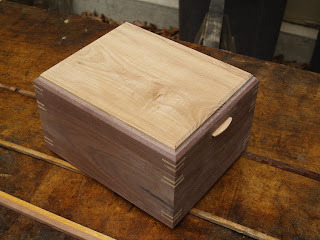 Today I posted part 2 of Making a Crematory Urn Box to the Fine Woodworking website. Part one was posted earlier in the week. 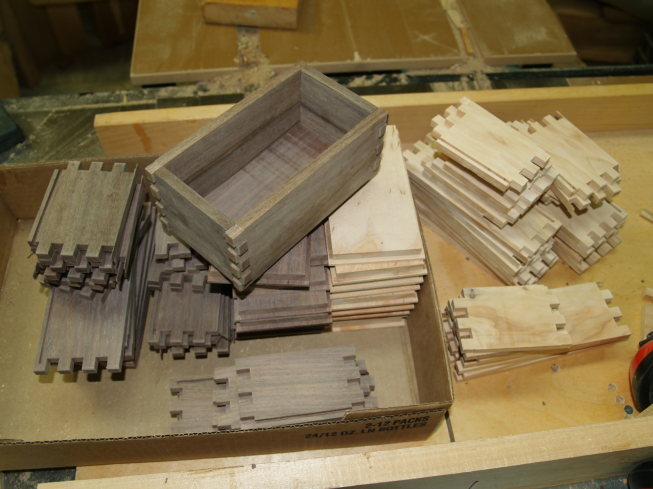 Today in the wood shop, I will be sanding box lids, routing for lid pulls to fit and preparing stock for school on Monday. Here in the US, there is a long tradition of involvement by religious institutions in the education of our children. Many of our first schools were religious ones, and even early public schools believed that religious instruction should be part of their mission. Conservative politicians now decry the absence of prayer in schools as being the cause of educational failure and moral decline in our culture. Parents in many cities make the choice between sending their children to either public school or to schools that have religious affiliations. The idea for many parents and politicians is that religious schools offer greater moral instruction, and that public schools do not. The point should be made that instruction is useless or even damaging in comparison to experience, and that the values inherent in craftsmanship far exceed the emptiness of moral instruction. Telling children to be good is one thing, and offering them the opportunity to be good, and to arise in their highest capacities another. Making things of useful beauty, allowing voices to rise in harmony, using instruments of all kinds to create better, more meaningful lives for each other, their families and communities is a thing beyond the emptiness of mere instruction. Make beautiful things, make music, make lives. In the photo at left, you can see my current batch of finger-jointed boxes nearing completion. 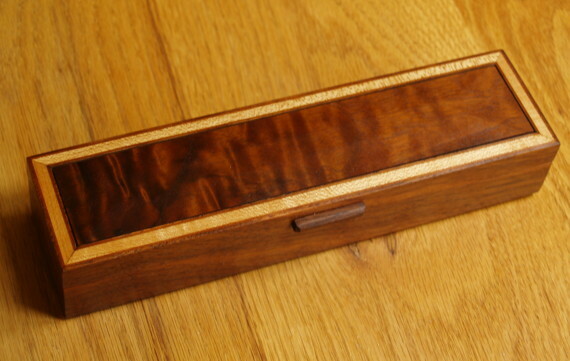 Each now is ready for me to sign, apply Danish oil, and attach pulls as shown in the box at center and below. Scientists tend to get rattled by inaccuracies, and imprecise language, and when the topic of conversation falls to the left and right brain, some go ballistic, or at the very least are reminded to remind those of us on the artistic side of things, that we are indeed idiots even though we apply our own precision to the making of real things. The scientists, are right, however in that the left and right hemispheres are not indeed separate things, but rather are intended to cooperate in the effective survival of each and every individual within each species and have been since the dawn of time. In the same way, we regard the left and right hands as separate things, and note that we are either left or right handed, when nothing could be further from the truth. Take a small piece of paper and let it rest on the desk. Then take pen in hand (either one) and write with the other hand held behind your back. You will find that your behind-the-back-held hand would have been plenty useful in stabilizing your paper as you wrote. The left and right hemispheres of the brain cooperate in the same manner. While the bird's left brain can perceive a seed in a field of sand, the bird's right brain is sensing the whole of life around it, sensing the field of friend and foe, just as you hold the paper in stillness as you write your letters with either your right or left hand. When Jill Bolte Taylor suffered her left brain stroke as described in her book, My Stroke of Insight, she noted that as her left-brained organizational capacity failed (and she watched it happening) she was left in a state of right-brained nirvana, a state which no language could accurately describe without venturing into non-scientific spiritual jargon. It was this spiritual domain that Pestalozzi attempted to describe as Anschauung (direct or immediate intuition or perception of sense data with little or no rational interpretation). Goethe used the same term in his efforts to get early botanists to look at the whole of life, to sense our biological wonders as more than a sum of classified parts... It is this spiritual domain that becomes lost when students are thrust only in worlds of words, with "performance" consisting of standardized tests. Today I've been making lids for the finger jointed boxes I assembled yesterday and today. 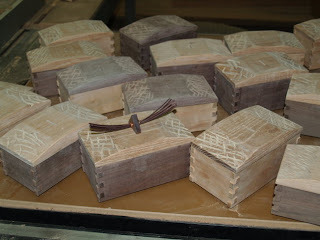 After the lids are sanded, they will get a slot routed in the top for a pull made of walnut, reed and copper wire. Today's progress is shown in the photo above. I am working at home today. Yesterday I began making boxes using my dedicated finger joint router set-up. This morning, I've sanded through the skin at the tips of a couple fingers and have green protective tape on a few to keep matters from getting worse. 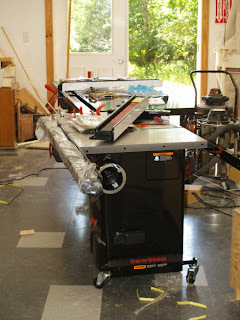 I also have been trying to sell off excess equipment to make room in the wood shop. I have a whole lot of cleaning to do in both shops, here and at school. I continue to be intrigued by Pestalozzi's concept anshauung as it describes a non-discriminatory state of mind, much like what Buddhists strive to attain, in which the incessant naming of things begins to cease, and things are seen in relationship, defining not separateness, but the unity of all things. In an earlier post this week, I mentioned Goethe's use of the term anschauung as he discussed the narrow mindedness of modern science as it was developing in his time. There is a strong relationship between anschauung and the non-discriminatory mind. It should come as no surprise that those in the East, and those in the West, taking time to observe the processes of human thought, might come to similar observations. The major challenge facing American education at this time, concerns how we move from being a left-brain centered child development model to one that fully engages the whole child. My answer is simple. When you are making something real in service of your family and community, that expresses useful beauty, both hands are involved and both hemispheres of the human brain. Make music, make art and the spirit of humanity within education is restored. These are two articles about the best and worst performing high schools in the US, offered for comparison and to make a point. The first is about Minnesota High Schools and tells that if these schools, some of the very best in the nation, had not been wealthy enough to not qualify for title one funds, they would have been shut down for failure to meet NCLB test requirements. The second article about some of the poorest high schools tells another story, but essentially the same one from another side. Poverty takes a heavy toll on our nation's future. Where communities invest heavily in their children's educations, we all are brought to better conditions, but this story is where schools in some of the most economically depressed areas of our nation are fighting a losing battle in the education of our youth. You will find in comparing these two articles that our nation's obsession with standardized test scores continues to make things much worse. Misguided "conservative" politics have made teachers the whipping boys for our nation's educational failure. But one of the greatest real determinants of educational success is poverty. Shame on all those budget cutting tea party nincompoops whose malicious personal agendas prevent real solutions for the problems facing our nation's schools! The idea that cutting budgets, lowering taxes for the rich, and failing to lift a hand for the poor is the ultimate long-term public policy disaster. The idea of using standardized test scores to "hold teachers accountable" and thus improve schools is asinine. Today the 1st through 6th grade CSS students leave for their 2 day camping trip. Our CSS carving knives will travel along and be used around the campfire. Those who have not camped with a group of children and observed how they grow and mature through years of such carefully planned activities, should use their imaginations to tag along, at least in spirit and see what real education is like. This morning I posted an article (part one) about how to make a crematory urn box on the Fine Woodworking website. I have been reading about Woodbine Agricultural School, inspired by a blog reader who had sent me a couple articles about it. Woodbine was established in the Cape May, NJ area, with capital from the Baron De Hirsch Fund which helped to provide relief and educational opportunities for Jews escaping pogroms in Russia during the late 19th and early 20th centuries. Some readers will remember that one of the important American Sloyd texts was written by B.B. Hoffman, Superintendent of the Baron De Hirsch trade schools in NYC. The Baron De Hirsch fund thus played an important part in the history of manual arts training in the US, while specifically attempting to save lives of Jews fleeing persecution in Europe. You can find a photo gallery of the Woodbine School Here. And you can read about Woodbine in the 1906 Jewish Encyclopedia. 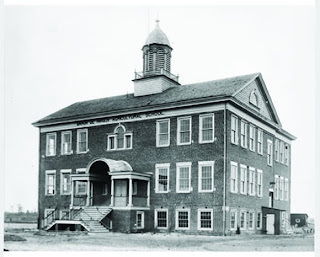 The photo above is the Baron De Hirsch Agricultural School at Woodbine. Woodbine was not only a school, but an intentional utopian community, much like many others formed during an era in which arts and crafts and agriculture were understood to have transformational attributes, effecting the character and intelligence of each individual while creating community. "The public school system also has a civic purpose," says Jonathan Zimmerman, an education historian at New York University, citing a common academic argument against vocational education. "You're not just preparing people to work. You're preparing people to be citizens. In a democracy, you need citizens who can think critically." But people with jobs, especially skilled jobs, tend to be better citizens than those without them. And the teamwork involved in the training programs at East Valley and on the Navajo reservation tends to help create a sense of community. "In my home high school, you're sitting in a room with 30 other students who don't care, trying to pay attention to a teacher who doesn't care," says Aaron Pietryga, who is training to become a firefighter. "But [East Valley] is like my family. Most of the kids at my home school don't have any idea what I'm doing in the afternoon, and when I explain it to them, they say, 'Wow, you're doing all that cool stuff, and you're going to college. Why didn't I know about that?'" We may be at that point at which the tide is beginning to turn and we all come to a greater realization that our hands are our best instruments for learning, and for engaging our passions in the pursuit of a better world. It's about time. Today in the CSS wood shop, 7th 8th and 9th grade students will be working to finish various projects before the end of the school year. I have lots of work to do setting up our new SawStop saws before the start of ESSA classes. Today some of the students helped. This week's Time Magazine has an article about the resurgence of CTE, Career and technical Education, Learning that Works. The article spells out the problem and then describes how some ground breaking programs are breaking the ice to put things back on track. "Vocational education used to be where you sent the dumb kids or the supposed misfits who weren't suited for classroom learning. It began to fall out of fashion about 40 years ago, in part because it became a civil rights issue; voc-ed was seen as a form of segregation, a convenient dumping ground for minority kids in Northern cities. "That was a real problem," former New York City schools chancellor Joel Klein told me. "And the voc-ed programs were pretty awful. They weren't training the kids for specific jobs or for certified skills. It really was a waste of time and money." Unfortunately the education establishment's response to the voc-ed problem only made things worse. Over time, it morphed into the theology that every child should go to college (a four-year liberal-arts college at that) and therefore every child should be required to pursue a college-prep course in high school. The results have been awful. High school dropout rates continue to be a national embarrassment. "Some students can respond to two-dimensional learning, but most respond better when it's hands on. Every surgeon needs to know how to sew, saw and drill." It is foolish for our nation to continue a two-dimensional educational strategy on the cheap. We all learn best, learn at deepest levels most efficiently, and to greatest lasting effect when we learn hands-on by doing real work. Doing real lessons in school would end the drop-out crisis and better prepare students for success. Even students who are going to college are more excited about learning when the do real things. Now, why would that be so hard for educators and politicians to understand? One of the challenges that all schools face, even the best of the ISACS and NAIS independent schools, and the best of American universities is that of the silo effect which I mentioned in an earlier post. The silo effect leaves professors or teachers isolated (often comfortably) in their own classrooms where they too often fail to take the advantages offered by collaboration with colleagues, and neglect to offer interdisciplinary studies to their students. The result is the loss of vigor in education, as studies become mind-numbing, and unadventurous. Studies confined in silos can be quite rigorous and within silos, students can be held to high standards, but not without paying a high price of attrition. Even students diligently present each and every day, will pay little attention to materials presented without vigor or without relevance established in their own lives and to their own interests. When I was an accreditation review team member earlier in the year at an ISACS accredited independent school, the history department review team was concerned with the presence of the silo effect, each teacher happily doing his or her own thing, while the practical arts department was concerned that their own efforts at collaboration were made to no avail. The practical arts including wood shop were undervalued by teaching staff in silos and thus unresponsive to opportunities for interdisciplinary collaboration. That is where A+ Schools can safely enter the picture. The A+ Schools program originated in North Carolina with the purpose of putting arts integration at the center of school life. If the arts are present, the hands will be also.Here in Arkansas, the A+ Schools program has been adopted by the Thea Foundation and championed by former Arkansas Governor Bill Clinton. The training to become an A+ School involves the entire school staff, from janitor to principal, because it is absolutely essential that everyone on staff has an equal opportunity to become fully cognizant of the value of the arts. In other words, professors and teachers of various disciplines must leave the relative security of their silos. Participation in A+ comes first from a decision at the top, followed by total buy-in at all levels as to the value of the arts. There are two ways to accomplish our goals. The one is to get school administrators to acknowledge the need to lure teaching staff outside of their silos to engage in collaboration. 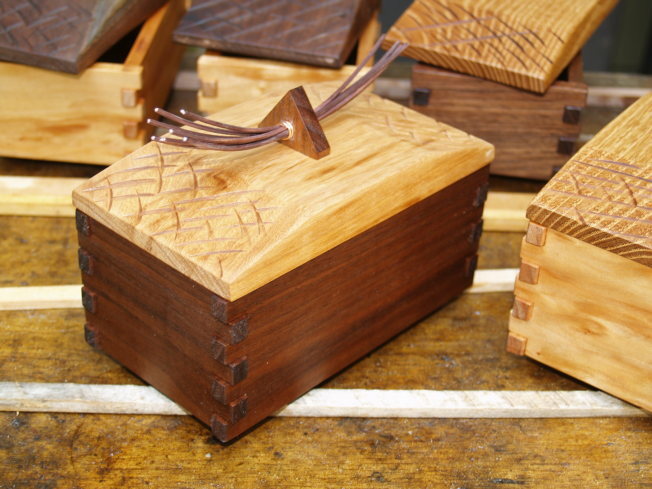 The second is to have projects available that establish the relevance of woodworking education. 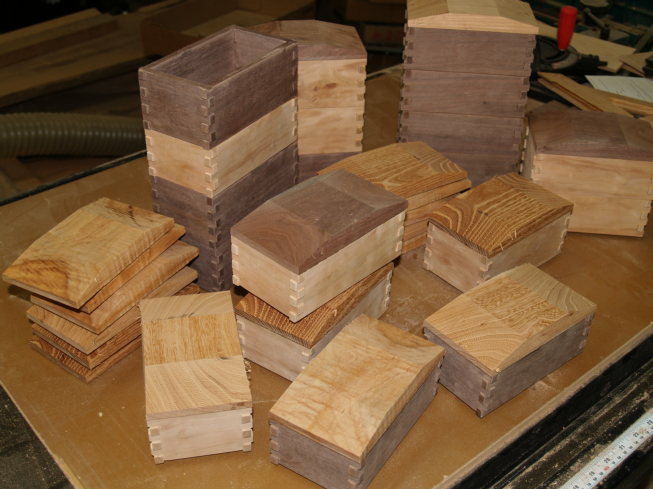 It is extremely difficult for those in academia to see value in such things as wood working. The view from the silo is narrow and exclusive. But I was just informed that the Boston Public Schools system has recognized woodworking in schools as ann offering in the arts, its status being equal to drawing, painting, or music. That was a first step in getting schools to recognize the potential of woodworking education to re-energize learning. Today we tested the bridge models we'd made in wood shop. The lightest bridges were the winners, though one bridge made with an arched form reached a total over 600 lbs. before failure. The winners were chosen based on the the highest ratio of load to weight. We weighted each bridge, the lightest being 1 1/4 lb. and we used 80 lb. sand bags, buckets of gravel and rocks to gather enough weight to break the bridges. The strength of these simple forms was amazing. The photo below shows the winning bridge before being pushed to its limit at 301 lbs. The photo at top shows an arched bridge just at the point of collapse. 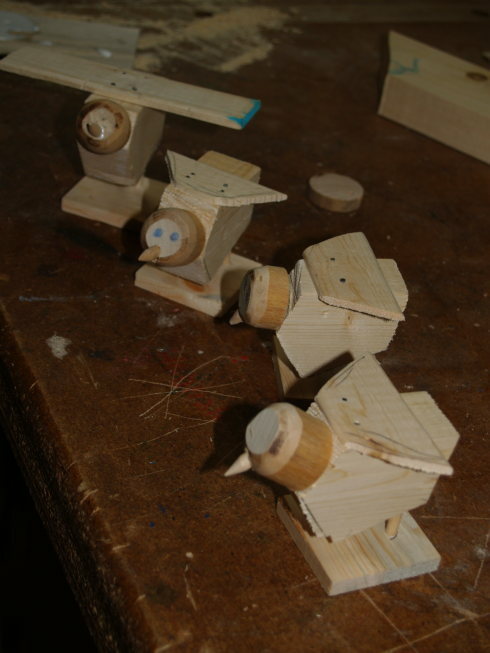 Today in the CSS wood shop, the first, second and third grade students made wooden baby chicks in celebration of the real chicks that hatched last week. Their teacher suggested that they might want a wooden reminder of the wonders they had observed. Students asked where I learned to make these. One student asked if I learn to make things by watching television. It is nice to see one's own ideas appreciated by kids. But inherent in the process is development of understanding. How to make, how to use tools and materials with care, how to use spatial sense, how to work together in teams... these things and more. The evolution of the opposable thumb corresponds to the development of the frontal lobe of the neocortex, bringing with it the higher cognitive abilities related to creating beauty, precision, and art. The most refined human activities and aspirations have been made possibly by the precision grip and the finely tuned nervous system that underlies it. Now, the advent of TV, cell phones, computer games and typing on a keyboard is causing young people to forego mastery of the physical art of writing. As a result, they're losing the opposable thumb and the skills that go with it." (p. 59-60)"
There is an article in this month's National Geographic called "the common hand" which shows the skeleton hands of diverse creatures, from bats, to frogs to creatures of the sea. And yet it calls to mind the wonders of our own hands. "The hand is where the mind meets the world. We humans use our hands to build fires and sew quilts, to steer airplanes, to write, dig, remove tumors, to pull a rabbit out of a hat. The human brain, with its open-ended creativity, may be the thing that makes our species unique. But without hands, all the grand ideas we concoct would come to nothing but a very long to-do list." There is actually much more to say about the hand/brain system than that. Scientists, working from an analytical framework, take things apart and view them as components, classifying them according to similarities and differences, thus often missing essential aspects which might be captured from a more holistic view. Thus the hand and mind are seen as separate things, not an integral system for learning and creativity. Pestalozzi used the German term Anschauung to describe an education less dependent on words and more embracing of relationship between things. Johann Wolfgang von Goethe was another German philosopher who used the term Anschauung. He believed that botanists of his time were so obsessed with the analytical processes of classifying plants, that they were missing important relational aspects between species, matters of co-dependence and symbiosis. The same thing happens in education, and has been called the silo effect... Teachers are expected to act and teach as though their disciplines are separate from the full breadth of human experience. No wonder students become bored, disinterested and disruptive. You will note that the naming and classifying of things is a left-brained operation. Early educators like Pestalozzi saw danger in creating "one-sided" students, lacking in essential non-verbal, non-quantifiable components for their success. Today was a big day at the Clear Spring School and in my home wood shop. 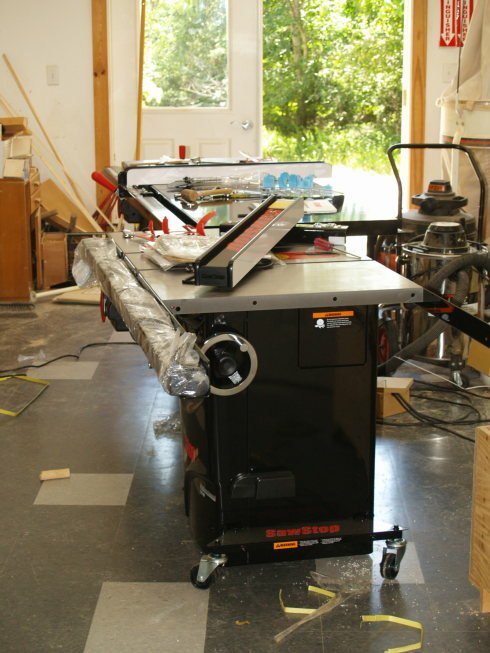 SawStop saws were delivered.